This week: The New England Aquarium gets an LED makeover, the old-looking new lighting in Venice, and the ongoing boom in packaged LEDs. Unit sales of packaged LEDs for general lighting will triple in the next three years, and revenue will double, according to an IHS forecast. Analysts there expect sales to balloon from $3.6 billion this year to $7.1 billion in 2016. The average selling price will decline in that time from 41 cents to 25 cents (and to 19 cents by 2018). Doing the math for 2016, we find that unit shipments of 8.8 billion in 2013 will grow to more than 28 bilion in three years. The residential sector will account for 40 percent of that $7.1 billion, according to IHS. Thirteen days after the US government shut itself down and furloughed thousands of civil servants, the shutdown's effects are beginning to be felt in the lighting industry. Some government websites aren't functioning. In particular, if you want to find out if a given lamp is Energy Star certified, you can't at the moment. There is no particular reason why any government website needs to display such a notice. As long as the datacenters where they are housed continue to enjoy power and connectivity, the websites should chug along unattended for the most part. The Department of Energy's Energy Efficiency and Renewable Energy (EERE) site is still working, for example. Chalk it up to scattered employees in isolated pockets of the government choosing to send a message out to the public. As part of a six-year renovation and modernization project, Boston's New England Aquarium has installed 160 LED lights supplied by LumenPulse of Montreal. The luminaires, some of which were custom designed for this project, feature a high CCT rich in blues and greens, which penetrate deep into water and pick out details. In any event, red spectral content would be mostly wasted in aquarium lighing, because red light doesn't get much beyond water's surface. Available Light chose 5,700K downlights with 10° and 20° beam spread for lighting the tanks, including custom-designed WBG (white-blue-green) color-adjustable luminaires for the Giant Ocean Tank. 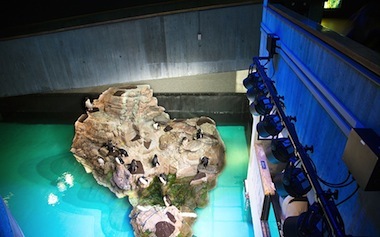 The penquin pool (shown here) is illuminated with 4,000K lights. The city of Venice has replaced 7,000 traditional lights with LEDs. The Italian lighting firm Litek was retained to manage the renovation. It performed extensive testing over four years to assure the Commission for the Architectural and Landscape Heritage that the new lights would look the same as the old ones in both exterior design and light output. In Piazza San Marco, 6,000 mercury-discharge post-top luminaires were replaced with SSL units incorporating Philips Lumileds Luxeon K LED arrays to produce light at 3,000K CCT and 80 CRI. In other areas of the city -- the Rialto, the Accademia Bridge, and the Grand Canal -- Litek developed replacement lighting modules for 1,000 existing fixtures using 3,000K Luxeon M LEDs.